1. Bring a large pan of water to the boil / use a kettleful. Add spaghetti and cook for 8 minutes until just cooked. 2. Meanwhile, melt the butter in a large frying pan / wok, add the garlic and onion and sauté for a few minutes. 3. 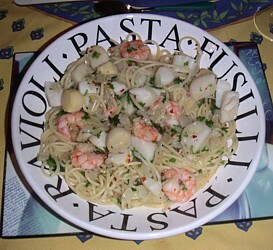 Add the scallops and prawns, cook gently for around 5 minutes. As the scallops thaw, snip in half with a scissors if you like. 4. Drain the spaghetti, tip it over the scallops. Mix well and season with some freshly ground black pepper. 5. Sprinkle the chilli flakes on top, garnish with the parsley, and mix well before serving in pasta bowls or on plates. Melt a knob of butter in a small frying pan. Add a finely chopped clove of garlic. Halve a dozen or so cherry tomatoes and add to the frying pan. 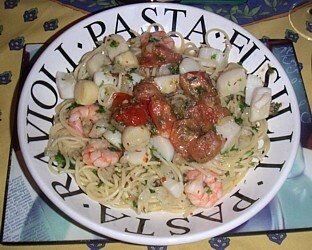 Sauté gently for a few minutes, then put half on each bowl of pasta as a topping – delicious!! Lovely with warm foccaccia / ciabatta / French bread to mop up the juices.